Coming from a childhood of poverty, I have struggled for many years with the concepts of wealth and poverty as well as blessings and curses. 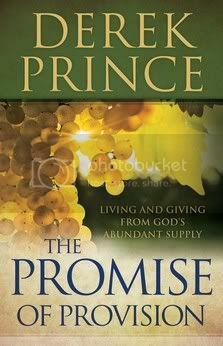 The Promise of Provision: Living and Giving From God's Abundant Supply is the first book I have ever read on God's provision that is truly Biblical as well as easy to understand. Although I have learned some of these principles in my own life over many years, I find my own experiences to be confirmation of Derek Prince's provision philosophy as expounded in this book. When God blessed His people, He did so by promising them children, abundant harvests, increased herds, plentiful food, victory over enemies, bountiful storehouses, good weather for crops, prosperity, productiveness in their labor, recognition of their county by other countries, and more. In Deuteronomy 28, He blessed the people who obeyed the voice of the Lord their God and stated that these blessing would "come upon you and over take you." Such a powerful promise in exchange for obedience! All of God's promises hold the provision. All of God's promises are our inheritance. All of God's promises are an expression of His will. All of God's promises are now available to us through Christ. All of God's promises being fulfilled do not depend on our circumstances, but rather upon our meeting God's conditions. The five conditions outlined in the book are admitting your true motive; faith is essential; honoring through giving; right thinking, speaking, and acting; and let God add--in His way and in His time. Then there is the purpose for provision which is to invest in people. I have been very moved by this book, because it is not about building wealth nor glorifying poverty, it is about God's promises of provision, which not only are sufficient but are abundant. It is about understanding that God wishes to give to us, so that we can give abundantly in honor of Him. I highly recommend this book for Christians in all financial situations. Disclosure of Material Connection: I received this book free from the publisher through the Bethany House Publishers book review program. I was not required to write a positive review. The opinions I have expressed are my own. Yes, I have struggled with this teaching because it has been so abused. Where we are now seems to have a truly biblical approach.